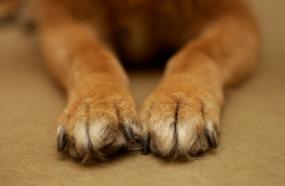 A broken dog nail can be quite painful, and this can make it difficult to remedy the situation. Share some recent visitors' requests for advice. My dog broke his nail right on the quick and it bled, but he will not let us touch his paw. I put some hydrogen peroxide on it to clean it up, and my vet wants to put him to sleep in order to cut the nail. Should I just let it be and wait until it falls off? He is deaf, and has never liked anyone playing with his feet. Since he is deaf, we are unable to comfort him by talking to him like we do with our two other dogs. The last time he was put under anesthesia, it took him three days to come out of the stupor and I hate to see him go through this for one nail. I can't wait to hear from you. One of my own dogs once tore a nail and had to have it completely removed. I worry that your dog may do more damage to himself if the nail catches on another surface. The open quick also stands a chance of becoming infected, so I do recommend that you have a vet remove it. Some dogs just don't react well to anesthesia. I don't know how big your dog is, but if it previously took him three days to recover from anesthesia, there's a good possibility that he was over-anesthetized. How confident are you in your current vet, and is this the same person who performed the previous procedure? Remember, it's okay to get a second opinion from another vet. Best wishes for your dog's recovery. My husband accidentally cut the quick of one of our dog's nails this morning. We used styptic powder to stop the bleeding. I am wondering how quickly the nail will heal, and how long I should wait until I take him for a walk on the sidewalk? Nipping the nail quick seems serious when you see how much it bleeds, but these things tend to heal very quickly. I'd refrain from walking him on rough, hard surfaces for a day or two, and then you should be able to resume normal walks. If the nail happens to open up again, just use more styptic powder and confine him to his crate for ten to fifteen minutes to give a chance to seal again.